You are here: Home / RESOURCES / How Much Is a Cord of Wood? If you only burn firewood a few weeks a year or only when you reach to your vacation home in the mountains, perhaps you do not necessarily care so much about the extra prices on split logs. Small price differences are less likely to affect you. The same goes when you take a camping trip with your friends and need some wood for the campfire. However, if you start doing it in the fall and you end burning wood in the spring, chances are you should be more careful when you buy. You will probably buy larger amounts, only to end up with a better deal. These parcels of wood are known as cords. You buy wood in cords, but the technical explanation can get a bit challenging because there are more type or cords – face, true, fireplace, partial, four foot cords and so on. Plus, the actual size is only one of the factors. It is worth noting that hardwood is more expensive, but also burns longer than softwood. The wood should not rot either, not to mention the excessive moisture. With these ideas in mind, there are a series of things to pay attention to, yet understanding the cord is probably the most important one. A cord of wood is basically a parcel of wood. The wood is neatly split into small splints, then stacked accordingly in a cord. The cord is a volume measurement, as wood is sold in volume only. Sure, you can find different measurements in camping stores or perhaps large supermarkets with designated camping aisles. They can be sold in small packs too, not to mention small sacks. However, when buying large amounts for longterm uses (such as the whole wintertime), chances are most businesses will sell cords of wood, among a few other measurements (like a truck or a run). The full cord is the classic measure – 4x4x8 feet. This is the standard measure for firewood. However, you should know that four foot pieces are rarely used for heating your home. Therefore, it might be hard to find firewood in this form. Sure, it would be the most efficient way to get it. This is exactly what makes shopping for firewood so challenging. About 33% of the full cord has 16 inch long pieces. Other types of cords might have shorter pieces though. There are more lengths available in commerce, yet the actual 16 inch length is the most common one. It might be wise to avoid buying firewood in lengths that are not recognized to be standard. You have to measure the length, width and height in order to determine how much wood is in a cord. If you use centimeters, you have to multiply these three measurements, then divide the result by 1,000,000. If the cord is measured in inches, divide the result by 1,728. If you want to convert cubic feet to cubic meters, you should divide the amount of cubic feet by 35.3. An easier explanation claims that a cord of wood is the amount of firewood that can fill the space – 4x4x8 feet. As the standard length is 16 inches, you will have three rows of wood stacked over eight feet in length and four feet in height. A cord of wood may have different prices, depending on the supplier. It might be a good idea to avoid firewood that is not related to the standard cord. You might find station wagon measures, as well as truck loads. They are quite hard to compare and measure, so you risk paying a lot for the actual cord. Do the math even if you do not find other options. If you end up with a different cord size, divide the splint length into the full cord length – 48 inches – and multiply by the price. 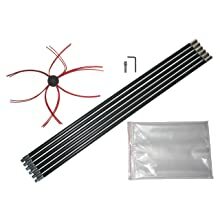 If one business sells stove cords (4×8 feet) for $65 and the splint measures 12 inches, then the full cord price is 48/12×65, which is $260. Making the difference between hardwood and softwood is easy if you look at the leaf. Hardwoods come with wide leaves, but they also lose all of them during the fall. Maple, beech and oak are probably the most common types of hardwood. These types are said to be superior to softwoods because they are quite dense. A dense wood will inevitably come up with a longer lasting fire. Another good news is that there are no sparks, while the smoke is low. Plus, once the fire is gone, the hot coals will still provide radiant heat for a while. If you compare a cord of hardwood to a cord of softwood, the hardwood will provide more British Thermal Units (BTU). It does not mean that all hardwood is qualitative though. Some of the cheapest hardwood might be softer than the most qualitative softwood. If there is one negative part about hardwood, that is the fact that it is heavy and requires a longtime to dry out – sometimes even up to two years. The price is also higher than for softwood. Identifying softwoods is not hard either. They have needles and a refreshing aroma. The most popular softwoods include red pine, cedar and fir. The best part about softwoods is that they grow relatively fast. This is also why the wood is less dense than in hardwoods. Softwood also weighs less. It burns pretty fast and aggressively due to the resinous composition. Such fires are likely to cause sparks and even crackle. But on a positive note, softwoods tend to season way faster than hardwood. They burn easier as well, so this is why plenty of people use them for kindling. Some people may dislike softwoods because they create too much smoke. Instead of hot coals, they also leave ash behind. Their coaling capabilities are poor, so they are not so good in overnight burning. They are more popular for kindling, but they also help in setting campfires. Sometimes, they might be mixed with hardwoods, only to add some sparkle and light a slow fire. Firewood is easily accessible everywhere. It depends on how much money you are willing to spend, yet price discrepancies are not so high. You can find local businesses commercializing wood, but there are also plenty of online sellers. It might be a good idea to actually see the wood in person before ordering, especially if you are experienced with the differences between quality and worthless wood. You should also be around if you opt for a delivery service. Do not let a neighbor or a friend take the shipment over, as it also requires a little inspection and measurements. There are a few handy tips to remember when buying firewood. Although you are free to get a cord of wood, you should also ask the seller for the cubic meter measurement or perhaps the cubic feet. The cord can be a little misinterpreted, so you should also have the other alternatives. If the firewood is delivered by your door, you should ask for it to be delivered stacked. This way, you can measure it before getting it unloaded. If it was measured upfront, then thrown randomly in the truck, you can only take the seller’s word for it. After all, you do not feel like rearranging it all. Be around when the firewood is delivered. If you rely on other people to accept the delivery on your behalf, you risk getting tricked. Sure, you can hand this job to a friend if they are more experienced than you are. Keep the recipe. It should mention the type of firewood, the seller and the price. When storing firewood, it is essential to learn how to protect it accordingly. From this point of view, you should never let it directly on the ground. The ground is moist, so the exposure will ruin your wood in no time. It will start rotting as well. You should put something between the wood and the ground, such as a pallet. If you got a special place for it (like a concrete floor), do it. The firewood must be covered, but not entirely. The sides should be exposed. Use a tarp to protect it against harsh weather, but also to stimulate air ventilation. You should also look for a pet friendly pesticide to clear insects and prevent them from getting in. The pesticide should not be toxic. After all, at some point, the firewood will go burning, so you do not want those harmful chemicals in your lungs. 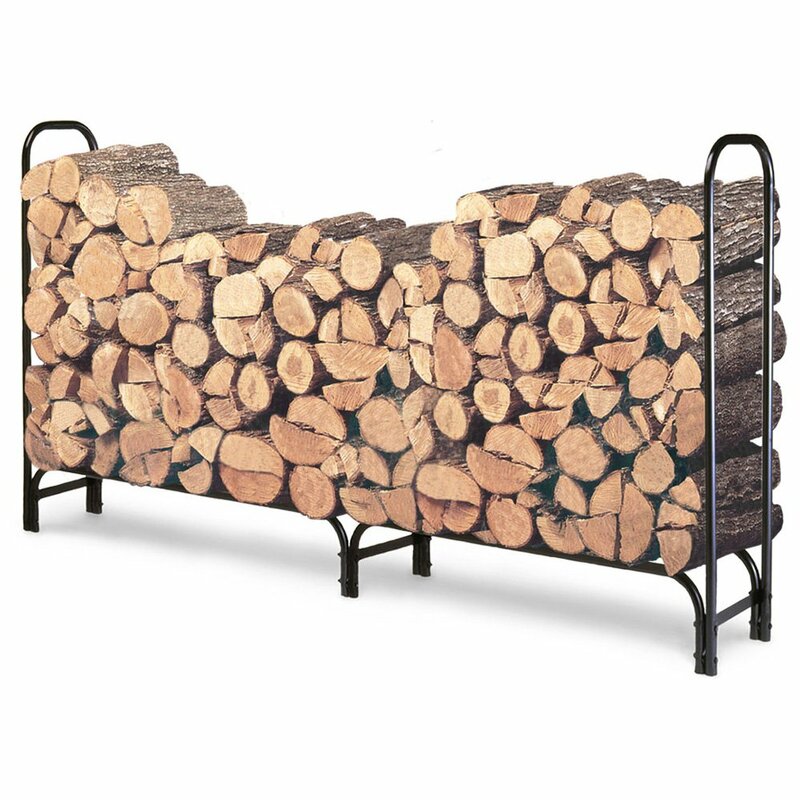 Landmann 82433 8-Foot Firewood Log Rack Only is one of the most efficient ways to store firewood. It measures eight feet in length. It can store about a cord of wood. With six legs, it is extremely stable, but it also keeps wood at a decent height – away from bugs and dampness. It is made of tubular steel and comes with all the required hardware in the package. Given its metallic purpose, you probably worry about the exposure to moisture – wrong! It is weatherproof powder coated to resist rust. It measures four feet in width, so it can easily fit on a deck or porch. 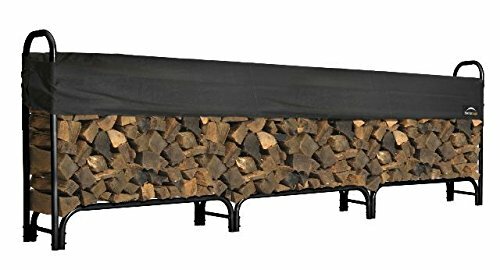 ShelterLogic Backyard Storage Series Covered Firewood Rack, Black, 12-Feet is worth a little attention too. It is slightly different from Landmann’s model. When assembled, it measures 142.7×15.5×46.6 inches. The good news is that it also comes with a two way adjustable cover made of polyester. It can be moved according to how high the stack is. If properly stored, this rack holds around 3/4 of a wood cord. It keeps mold and bugs away due to storing wood off the ground. It also prevent early rotting. Given the long length, it has eight legs for stability. Assembling it is piece of cake too. A wood moisture meter is highly recommended for any type of woodworking project. It makes no difference if you deal with lumber, distribute it, install a wooden flooring or plan to get some firewood. The moisture level is ideal in achieving quality results. Without a wood moisture meter, unexpected problems may arise when least expected. Some of the most common ones include cracking, buckling, cupping, hardly working joints and crowning. It sounds like an ideal tool for professionals, yet hobbyists and amateurs should certainly have one of these gadgets too. It lets them know precisely when the wood has the right condition for a specific project. 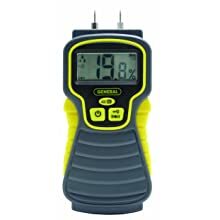 General Tools & Instruments MMD4E Moisture Meter, Pin Type, Digital LCD comes with a small LCD display that provides all the required information at a glance. It is small and compact, so it fits in just one hand too. It is a primary tool for both homeowners and contractors, only to assess and prevent water damage. The operation is fairly simple too. It has two stainless steel pins on top. Stick them into the analyzed surface and get an immediate result. Its measuring range is precise and accurate. No matter what you need the wood for, the good news is that you will never deal with water logged wood. This device is also used to assess water damage after a flood. When the air stings and nights are cool, the fireplace becomes the coziest place in your entire home. Make sure that you start the maintenance before actually needing the heat, so clean it upfront. A properly maintained fireplace is not just more efficient, but also safer for your entire family. Look up the chimney and try to spot any things that can potentially block it. For example, some birds may choose chimneys for nests. The same goes to falling leaves and even branches. Any block must be cleared right away. When it comes to the firebox, there is probably plenty of debris and dirt gathering in there. 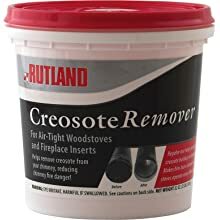 Rutland Dry Creosote Remover Chimney Treatment, 2-Pound goes through sticky creosote and makes it history. Everyone knows how hard it is to clean this substance. It looks like tar, but it also hardens. With this solution, it becomes loose and dusty, so you can brush it away with no effort at all. The good news is that the chimney treatment is safe to use in all kinds of stoves and fireplaces. The container has enough solution for up to 16 applications. Since you are less likely to clean the fireplace everyday, chances are you will have enough of it for many months. It is safe and risk-free for people. Gardus Inc RCH205 Sooteater Rotary Chimney Cleaning System is a simplistic, yet extremely efficient system that will remove all kinds of soot in no time. It is just as handy against creosote. It is more efficient than classic brushes, yet it looks like a whip. Cleaning the fireplace yourself is a breeze and does not require any experience at all. Regular maintenance will prevent flue fires. If you are worried about metallic flue pipes, this thing is less likely to scratch them, so you can use it without any concerns. It is flexible and will spin in any direction. When interested in cutting firewood, safety should always comes first. Never do it unprepared. Whether you use an ax or a chainsaw, such devices can become quite dangerous. Use goggles, long pants and gloves. If you use a chainsaw, some hearing protection might be just as handy for protection. If the wood has any nails in it, you should forget about it. A piece of wood is just not worth the extra risks. You will probably damage the ax or chainsaw, not to mention the dangerous flying nail. The same rule applies if firewood is too curvy. Handling unusual situations is usually the best way to end up with an accident. Rotten wood is quite common in this industry. For example, you might find some rotten pieces while cutting the firewood. Sure, rotten food is still acceptable, but not as desirable. It may not be a good idea to bring it inside though, but just leave it. It is probably full of insects and moisture, so it becomes useless. Last, but not least, determine what kind of firewood you need and learn to make the difference between hardwood and softwood. Hardwood normally has large leaves, while softwood has pins. Besides, soft wood will always have a pleasant aroma. It smells like pine, so it makes a good addition to any home. 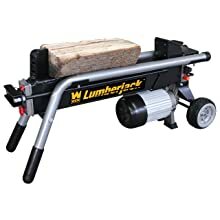 WEN 56206 6-Ton Electric Log Splitter is an excellent choice for those who want more than just the bulky logs they can find in any store. The machine comes with 2HP, as well as a copper wound motor. It is not too loud, but not too expensive either. The log guide ensures that you maintain the same size for the smaller parts. You can go up to 10 inches in diameter, not to mention the 20.5 inches in length. As safety is so important in any of these operations, you should know that each operation must be conducted with both hands. The machine is portable and comes with two 6 inch tires. 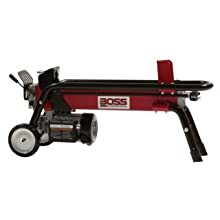 Boss Industrial ES7T20 Electric Log Splitter, 7-Ton is just as powerful. With a 2HP electric motor and a simplistic electronic start, using this machine will give you the convenience and efficiency that you have always dreamed about. It allows one handed operations without any major risks, while the ram returns automatically. The hydraulic system is designed to last. It is a professional grade model. All in all, this whole splitter is portable. It might weigh 106 pounds, but it has two wheels and two simple legs. You can pull the other legs and push the wheels. What can be easier than that? A firewood carrier is excellent whether you go on a camping trip or you run a little business. It is just as handy when you need to carry the wood inside for the fireplace. These accessories can be quite tricky. Some of them come like luggage or bags. Others have wheels, so you can transport a heavier shipment in one run. Each firewood carrier comes with its own specifications, hence the necessity to research your choices a little. Knowing what to expect from one model or another can prevent unexpected situations. 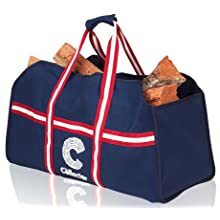 Zeemplify Premium Quality Firewood Carrier (Canvas 18oz) might look like the right luggage to carry your sports stuff to the gym, but it was actually created for firewood. Despite the canvas construction, it is extremely strong and can face the sharp corners of firewood without getting torn apart. The design is hand friendly, while the multifunction profile adds to the convenience. Get this bag when you go to the supermarket or when you take a camping trip with your friends. ShelterLogic Haul It Wood Mover is more specific and less likely to be as diversified as bag carriers. 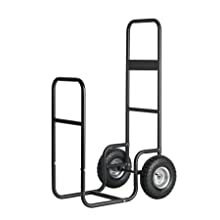 It comes with two large wheels, as well as a tubular steel design. It is finished with a black paint. Given the fit profile, it can go through plenty of doors. Tires are pneumatic. Although they might require inflation sometimes, the good news is that moving the unit is way easier. Altogether, this carrier weighs 25 pounds. It can become pretty heavy when filled with firewood though. However, given the two wheels, transportation should be quite relaxing. You can both pull and push, depending on what feels easier for you. As a short final conclusion, dealing with firewood does ask for some education. To most people, firewood is just something they use to heat their homes during the wintertime. To many others, it represents more than that. It requires attention, care and plenty of research for cost efficient and appropriate decisions – in both efficiency and comfort.